Palm Cove holidays begin with a short 20 minute coach transfer from Cairns Airport to Palm Cove. Accommodation at Peppers Beach Club & Spa Palm Cove located on the beachfront in the centre of Palm Cove, the resort combines luxury, first class facilities and service to ensure your holiday is a memorable one. For those wanting more affordable Palm Cove accommodation The Reef Retreat and Elysium Palm Cove are great accommodation options. Your first full day on holiday begins with a day tour to Cape Tribulation - A pocket of ancient tropical rainforest locked in a biological time capsule on the driest continent on earth. The skilled guides are experts on the unique flora and wildlife of the Daintree's wet tropic coastal lowlands and the mysteries of its evolution and survival over millions of years. Have a refreshing swim in the crystal waters of a secluded natural rainforest waterhole before returning to your Palm Cove accommodation. Palm Cove holidays are not meant to be hectic! Take a day tour to Port Douglas along the scenic Captain Cook Highway a winding road with spectacular views of the Coral Sea and spend the day enjoying the many shops and galleries in Port Douglas, you will find indigenous artwork and crafts alongside designer labels, whatever you are looking for you are sure to find just the thing! The coach picks up from all accommodation in Palm Cove. No Palm Cove Holiday would not be complete without a day on the reef. Reef Magic's Marine World is a purpose-built two story platform featuring spacious lower deck with ample undercover seating, upper sundeck with sun lounges, underwater observatory, children's safety swimming enclosure, easy access to the water for snorkellers, moon pool for ease of access for divers and fresh water showers. Return to your Palm Cove accommodation late afternoon. Palm Cove holidays are for relaxing and enjoying the local atmosphere, take the morning to relax by the pool, have a massage at the day spa or enjoy a walk along the beach. 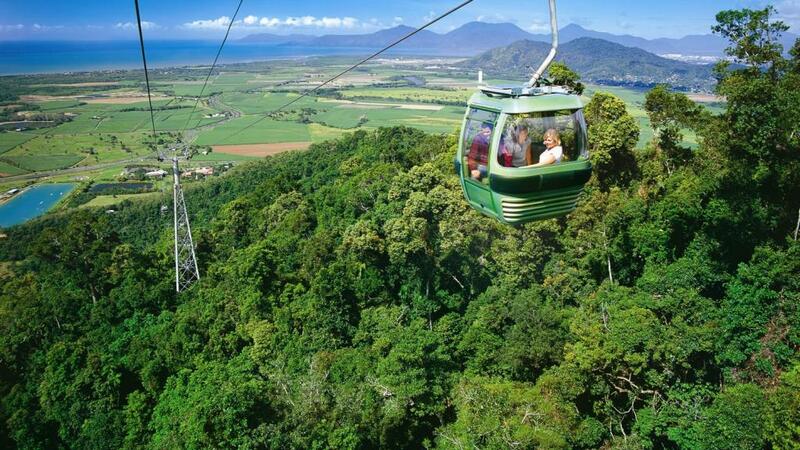 In the afternoon enjoy the spectacular views from The Skyrail Rainforest Cableway - 7.5kms over Australia's pristine tropical rainforests. You'll glide just metres above the rainforest canopy before descending through the canopy layers and deep into the heart of the forest at Skyrail's two rainforest mid-stations for the ultimate tropical rainforest experience. A Skyrail Experience will take approximately 1 and a half hours one way, or 2 - 2 and a half hours return. Time to head back to Cairns; as you depart the beautiful tropical north you can look forward to planning future Palm Cove holidays, or perhaps next time move further north - Port Douglas holidays are equally as memorable.